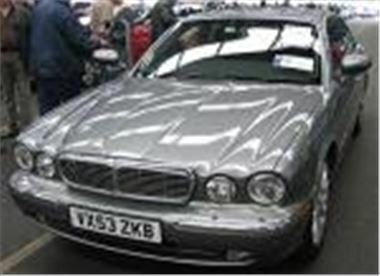 If you like the 2003/53 Jag XJ 3.5V8 in the photo you’ll get another chance at it in Top Car on Monday. The high mileage (65k) car bid to £21,200 today but should come for around £22,000, which is a fair price to get into a two-year-old latest shape XJ V8. A 71k mile 2002/52 BMW X5 3.0D Sport auto with leather but no satnav sold for £24,000. A 59k mile 2001/51 Audi TT Roadster (in need of a £500 timing belt ant waterpump change) went for £11,950. Top bid for a 34k mile 2004/54 BMW 525dSE auto with leather was £22,900 so that, too, may reappear in Monday’s Top Car sale. Sporty diesels are increasingly good news, which helps explain why a 31k mile 54 reg SEAT Leon TDI 150 Cupra sold for £10,950, why a 16k mile 2005/54 reg BMW E46 320dES bid to £14,500 and why a 63k mile 2003/53 Volvo S80 D5 facelift model Executive automatic sold for £14,400. Yet someone seemingly snatched a 66k mile 2001/51 VW Passat TDI PD 130 for £5,950. Cheap high milers today included a 132k Y reg BMW 325i Coupe sold for £7,350, a 93k mile 2001/51 facelift SAAB 9-5 2.3Turbo Aero estate sold for £6,850, a 120k mile 02 reg BMW 320dSE bid to £7,450, a 96k mile o2 reg X-Trail 2.2DI Sport bid to £7,425, a 99k mile 2002.52 old shape Espace 2.2DCI Authentique sold for £5,900 and a 117k mile 2002/52 Zafira 2.0DTI Elegance sold for £5,225. Among the part exchanges on the far side, a respectable 34k mile 2002/52 RAV4 2.0NV sold for £7,100, a 170k mile 2001/51 Omega 2.6CDX auto estate sold for £2,500, a 101k mile 2000W Vectra 2.0LS sold for £1,475, a 115k mile 94L BMW 318iSE auto sold for £1,400, and a 90k mile 97P BMW 318iSE auto which followed it sold for £1,950. What looked like the lowest provisional bid of the day to me was just £8,800 for a 67k mile 2001/51 facelift BMW 530iSE auto. A long way the far side of the £10,300 for which a 46k mile 02 reg 530i manual sold on Wednesday. Next week it’s Top Car at BCA Blackbushe on Monday, supposed to start at 11.00am, but get there early because a fortnight ago it started early at 10.30. Also BCA will be holding its first ever Vintage and Collector’s Car auction at its brand new Bedford ‘Supercentre’ on Wednesday 12th October. That sale starts at 13.00, with viewing 13.00 – 17.00 the day before and from 09.30am on the day of the sale. The address for your satnav is BCA Bedford, Coronation Business Park, Kempston Hardwick, Bedford MK43 9PR. Phone 01252 877317 or visit www.classic-car-auction.co.uk for the full entry list.